The HD-9STX is your 9,000-lb. rugged lifting solution if you need get something heavy up high, but you don't have a lot of space on the ground to lift it with. Perfect for vehicle storage and service—at the shop or in the garage. Whether you're a service professional or a DIY'er, BendPak’s got the right lift for you. This model is available with optional casters, dip-trays, jack platform and more. The BendPak HD-9STX is ALI and ETL Certified. FEELING BLUE?? Here's your chance to SAVE $$! BendPak is changing their standard lift color from their original blue to gunmetal gray, if you're in the market for a BendPak HD-9STX you can score a great deal! **Quantities are limited-offer while supplies last** Don't miss out, order your lift today! Here it is! This is the garage lift you've been waiting for.Finally a free-standing home / hobbyist four post parking / storage lift with all the features and quality of a true commercial lift. Are you looking for an economical answer to finding increased parking space? Are you looking for a true commercial quality four post garage lift that won't cost a fortune but doesn't sacrifice quality? If you answered yes to either of these questions, then you need one of the BendPak HD-9 commercial-grade home / hobbyist four-post lifts. These garage lifts are perfect for the car enthusiast who wants to be able to store and service his vehicle without spending an outrageous amount of money, yet still maintain high quality. Trying to compare this Bend Pack four post lift with others out there is like comparing apples and oranges. 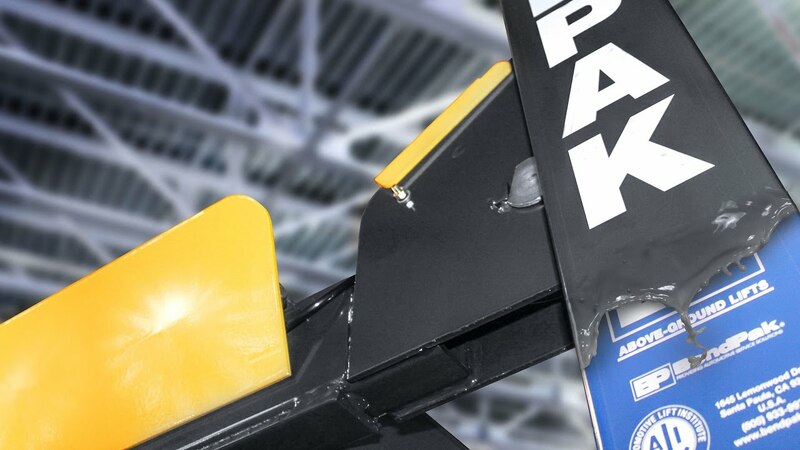 Every Bend-Pak 4 post storage garage lift is designed to be stronger, safer and easier to use. Bend-Pak really went the extra distance on this lift. They started with their previously popular four post home / hobbyist lift, and improved on it immensely. How? By giving it the quality and safety features of a true commercial grade four post lift, yet still maintaining a price that is within the budget of most home users.This just shows that Bend Pak is always a step ahead of the competition. Why Should you buy a Bend Pak garage lift? Safety is a priority - Ten position pneumatic automatic safety locks up and down each column ensure your peace of mind. Added to that is a secondary slack cable locking system that will engage in the event off cable failure. Only true commercial quality lifts have dual safeties like this. Does that other lift you're looking at have dual safeties? Odds are, it doesn't. It also has an air solenoid safety release mechanism. Much more reliable than the typical mechanical safety release found on most lifts. Air compressor is required for safety lock operation. Plus, these lifts are ALI Certified. If the other lift you're looking at isn't, then you need to keep looking. Superior Lifting Systems - Superior lifting system features FOUR high tensile strength (rated at 14,500 lbs. each) cables that are used on model HD9 portable garage lifts. All rollers are made of hardened steel and utilize self-lubricating bearings. Bend-Pak's four post lifts also use a futuristic UHMW ultra-high molecular weight polyethylene load bearings. They never need lubrication and last virtually the life of the lift. 5 Year Limited Warranty - Bend Pak guarantees your safety and satisfaction by offering a warranty few others will meet - (5 years on structure, 2 year on electric/hydraulic, 1 year on-site service) - call for details. Durable Finish - Runways are non-skid, to not only give your vehicle traction, but anyone standing on it as well. Heavy Duty Hydraulic Cylinder - Each lift is equipped with a single hydraulic cylinder, made to withstand heavy use. Hidden away under the runways for maximum performance and reliability. Extra Strong Wide Runways - wide, and formed with strong 3/16 steel. Made to stand up to unnatural abuse. Accommodates a variety of vehicle widths. Plus, wide design allows for added clearance. Optional Caster Kit - Allows you to move lift to any part of your shop! Surface Mounted Design - Avoids environmental issues. Easy Installation - No excavation required. All necessary hardware is included. Electric/Hydraulic Power Unit - Has a self contained maintenance-free electric/hydraulic power system that incorporates a fully regulated pressure relief system. All controls are easily within reach. Front Wheel Stops - Standard, can be replaced with additional drive-up ramps for drive-through capability. Extra Long Approach Ramps - Over 30”. Helps when attempting to drive extra low profile vehicles onto lift. They're detachable as well. These guys thought of everything! ISO-9001 compliant manufacturing facilities - Means state of the art manufacturing processes and no shortcuts. Top Quality - Only the finest quality components go into each Bend-pak freestanding garage lift. Starting at the beginning with high quality ASTM steel and ending with superior welds, bringing you a truly unequaled product. This lift is basically a scaled-down version of Bend-Pak's 14,000 lb. commercial garage lifts. It's chocked full of all the features that make it a truly professional series lift! The HD-9STX four-post lift has the same narrow drive through clearance as the HD-9ST. It has the longer runways (2 feet longer) of the HD-9ST, but it raises a a foot higher, this allowing you to park taller cars underneath. Check out the dimensional drawing in our MORE INFO tab for more detail. The extra long runways will allow you to place longer wheelbase vehicles on it, while allowing you to store a typical or taller automobile underneath. Store everything from ATV's, cars, motorcycles, lawn tractors and more up top using the optional aluminum deck option. But this is not just a great storage lift. Add the rolling jack or jack plate, and you've got a full on service rack as well. Utilize all of the wasted space in your garage. Then, if you want to move it, go ahead and roll it right out of your garage with the optional caster kit. Dependable design - Heavy duty aircraft lifting cables are made of stainless steel and premium hydraulic cylinder is conveniently located up underneath the runway making this a truly maintenance free product. Dual-hub cable sheaves - Most manufacturers use single hub sheaves. Using dual hub sheaves may caost a little more, but means greater longevity. Plus, all pulleys are double diameter. This significantly extends the life of your cables. When you buy BendPak, you get premium features found only on commercial quality models. Multiple level locking positions - The HD‐9 lifts are all fitted with multiple locking positions that are also adjustable. The adjustability is an unusual feature that most manufacturers don't offer. This is a handy feature that will help you adjust for various ceiling heights and for slope in your floor. A pneumatic safety release mechanism tops it all off by assuring that all four safeties disengage at the same time. Heavy duty aircraft cable - Many competitors take a shortcut on the cables. BendPak uses heavy duty stainless steel aircraft quality cables that are rated at 14,000 lbs. each, providing a capacity that is 640 % greater than the rated capacity of the lift. Take a look under the runways. These cables are safely and neatly enclosed up underneath the runway in a system that makes sure that they won't flop around and catch on things like may others will. Electric / hydraulic power system - So many inferior hydraulic power units are prominent in the market today. We see complaints from customers about other manufacturers units failing after only a few years. We utilize a maintenance free electric power unit that is dependable, reliable, and won't let you down after only a few years. One unique feature you'll find on the BendPak 4 post lifts is that the power unit is located to run in-line with the lift, not on the outside of the column. This means it wont take up as much floor space. Very important in a tight garage. Large base plates - 12 x 10" base plates allow the lift to be free standing, and makes for a secure footing that won't cut out from under you. Premium Hydraulic cylinder - Located safely up underneath one of the runways, so it won't get in the way. These are industrial grade cylinders. Not the inferior consumer grade cylinders that you'll find on competing models This is where you'll see many manufacturers take shortcuts. Premium single piece hydraulic cylinders are machined to precision with a pilot fitted hardened steel piston which is wrapped with custom fitted piston seals and wear bands and back ups, greatly reducing potential for leakage. The chrome rod is forged micro smooth to provide years of dependable use well beyond that of a typical cylinder and has a polished finish, plated to .001" diametrically. Advanced rod seals and rod wiper construction means that abrasion and wear are diminished to a fraction of the competition. Base materials with this attention to detail means that your end product will supply years of reliable service beyond the typical mass produced cylinder. Durable powder coat finish - The powder coating process used on the all XPR series lifts is superior to others in that it is a meticulous process that takes 10 steps to complete. First, all components are inspected to ensure they are clean before being sandblasted. After sandblasting, all components are washed through 5 stages of huge phosphate tanks that can handle parts up to 25 feet long. Once cleaned, the parts are dried immediately to prevent rust. Then, the components are Out-gassed, which is a process that pre-bakes the components in an oven to prep for coating. Many systems take a shortcut here. Doing that could cause problems with the final coat, including imperfections like chipping and bubbling, which is common on many inferior models. High temperature masking tape and silicone plugs are then used to cover any holes or components that need to be covered. Next, all components are given a thinner wipe to remove any possible prints or debris that could have occurred. After that, they are suspended on an electro-statically grounded conveyor line. and an electrostatic spray gun applies the powder. Finally, the parts are cured in 400 degree ovens for 3/4 of an hour. All this leads to the most durable powder coat finish in the industry, capable of standing up to the most harsh environments and chemicals you can dish out. Five models to choose from Take your pick. There's the extra-wide, standard height HD‐9XL. The HD-9ST is the narrow model with standard height and length, the HD-9 is the wide model with standard height and length, the HD-9STX is the narrow-width, tall model car lift. Then, there is the HD9XW, extra high, extra wide, extra long model. Integrated design - all components are fully enclosed within the structure of the hoist. Lifting cables, hoses, and safety mechanisms, and pulleys are all out of the way so as to protect them and also to not provide pinch points. Longer approach ramps - Having approach ramps that are slightly longer allows you to drive lower profile cars up onto the runways without fear of bottoming out. You'll appreciate that if you've got a low clearance sports car. Extra long approach ramps are also available as an optional accessory. Automatic safety locks - heavy duty cylinders assure that all four safeties will disengage when you press a button. This is a superior system to the typical mechanical safety release most lifts utilize. Safety locks are spring loaded and engage automatically when you raise the lift. plus, as an additional safety feature, there is a slack cable safety that automatically engages if the cable were to beak or slip off a pulley. Note - a small air compressor is required to disengage the safeties. Color Options - The standard BendPak color is blue. BendPak offers Red or black at an additional cost. Custom colors available for an additional fee as well. While the HD series garage lifts are designed for home hobbyist car enthusiasts who take their cars seriously, they are truly a commercial grade hoist. They sport all the same features as their larger commercial quality brethren, except at a much more affordable price. It's true that BendPak could have cut corners to come in at a lower cost like all those other consumer quality models, but that's not what they're all about. Nobody pays more attention to detail, and nobody makes them better. Why Should you purchase a Bend Pak lift from ASEdeals? 1) Guaranteed Lowest Prices - Listen, we monitor our competition's prices. We know we usually have the lowest price on most of our equipment most of the time. In the unlikely event you find any of our automotive lifts advertised anywhere on the web for less, just tell us where you saw them, and we'll beat them. It's that simple. Our prices will not be beaten! 2) Largest BendPak distributor -This means that you enjoy the benefit of our size. Not only does this allow us to offer the best pricing available, If you have any warranty issues that you feel are not being addressed quickly enough, or to your satisfaction, we have the influence with the manufacturer to get your issue resolved right away. 3) Years of Experience - So many internet companies have popped up over the past few years, claiming to have all kinds of experience, and then when you dig a little deeper, you'll find out that they've only been around for a few years. We've been carrying Bend Pak equipment for over 17 years now. When you call and speak to us, you're not getting just an order taker that knows nothing about the product. We know these products better than most. Not only will get you answers to your questions, we will make sure that you get the proper lift for your application. 4) Reputation - Right along with the years of experience comes our reputation. Check out our reputation on all of the various car enthusiast forums out there, such as Garage Journal or Corvette Forum. You'll find countless satisfied customers, praising not only our prices, but also our integrity, honesty and ability to help you choose the right product for your application. And then, there's our hundreds of satisfied customer pictures and testimonials to back it up. We'll gladly put our reputation up against anybody's. *Not all BendPak lift models meet the standards as prescribed by ANSI/ALI ALCTV-2006 or ANSI/UL 201. Conact ASEdeals for a complete list. Ht. to underside of runways when at top lock position - 78"
Notes: An air supply (minimum: 30 psi / 3 CFM) is required for the safety-lock mechanisms to disengage. It is solely the responsibility of the end-user to provide, install and maintain the air supply. 110 volt power unit available at no extra charge. Please specify when ordering. Wide models have two different options for runway placement. Runways can be placed 37.25” apart or 44” apart (distance between runways). Can be used for wide or narrow vehicles. Runways are 75.25” apart from outside of runway to outside of runway on HD9ST lift. If your vehicle's wheels are further apart that that, (from outside of wheels) you will need a wide model lift. *Not all BendPak lift models meet the standards as prescribed by ANSI/ALI ALCTV-2006 or ANSI/UL 201. Consult with ASEdeals for a complete list. The BEND PAK Lifts - As seen on TV!